"Roasted sweet peppers and garlic are tossed with goat cheese, parsley and capers in this delicious, easy pasta dish. Feel free to add any other greens in place of parsley such as cooked spinach or kale." Arrange peppers and garlic on the baking sheet and drizzle with olive oil. Roast 30 minutes in the preheated oven, or until soft and lightly browned. 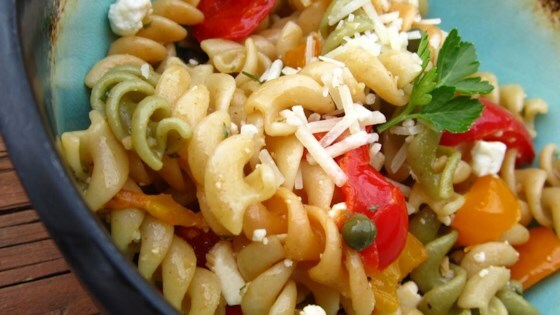 In a large bowl, toss cooked pasta with peppers, garlic, parsley, goat cheese and capers. Season with salt and pepper and sprinkle with Parmesan cheese to serve. See how to make a healthy, rustic Italian-inspired pasta. YUM!!!!! This was great. I cut back on the peppers (personal preference) and used 1/3 cup fresh parsley and 1/3 cup fresh basil. This was wonderful and got rave reviews.